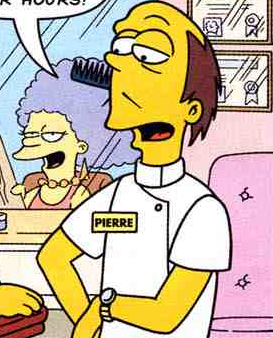 Pierre is a hairdresser at Clip and Save in Downtown Springfield. He cut Patty and Selma's hair and afterwards he told them not to wear down their hair or smoke during the next 24 hours, which they did hot listen to. His appearance is virtually identical to that of Howard, Sr., a florist. Modified on November 7, 2014, at 08:37.